Happy Sonic Day all! 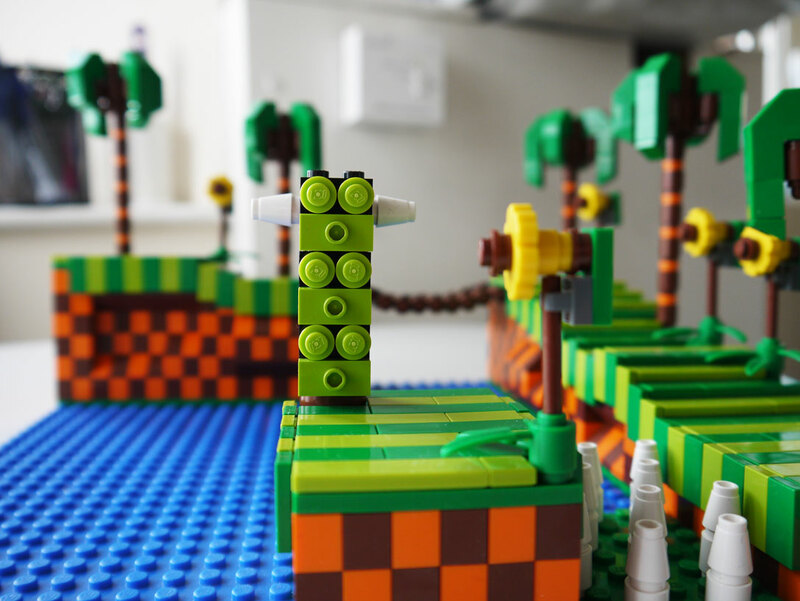 What better way to celebrate Sonic 1's 22nd anniversary than to recreate a small part of it in the world's greatest toy - Lego! Actually, I made this a little while ago, and hadn't got round to posting it - it only struck me yesterday that today would be perfect timing. The idea came to me, having recently got back into Lego for the first time since childhood, and I thought I'd give it a go. Lego.com has an awesome pick-a-brick service that I made a couple of orders on, and sure enough, some bags of lots and lots of small orange, brown and green bricks can be arranged into quite a nifty Green Hill scene. Couldn't quite get exactly all the bricks in all the colours I would have wanted, but I worked around it, though it's easy to get a bit carried away on there, with bricks as low as 6p. I think it all came to about £70 in the end. Whoops. Oh well! The intrusions and extrusions in the walls were a must - thank goodness for sloping bricks. It took me quite a while to come up with a good solution for the trees, working with the bricks I could acquire. A regular Lego palm tree or some foliage pieces would have looked rubbish, so I instead just tried to capture the general shape of them, as they're pretty specific. The leaf pieces actually ended up upside down. My favourite bit is probably the log bridge. This was a difficult one too. It's a little fragile, but what I had to do was link up small stick pieces with those little singular holder pieces, masked by the brown round ones in a rather complex pattern. Looks great though, as I can bend and twist them into the perfect shape so that it looks like the bridge droops a bit. Comments 18 Comments have been posted. Nice stuff dude; cracking job! That looks really neat! 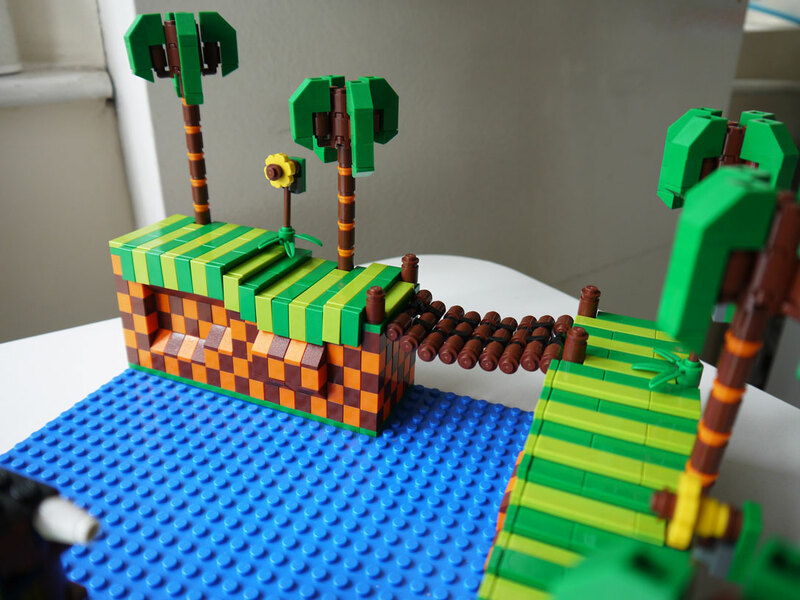 It even looks better than that papercraft Green Hill. Have to agree with Chemical Plant. Also, this looks really cool. Marble Zone would be SO cool in LEGO! You should submit this to Cusoo! Haha that is very cool. It's nice to see new blog posts! I agree Cybershell! I would love to own that. I wonder if they'll make Marble Zone out of Lego...? You're a genius, man. This looks so good. Heaps of detail, great colours, put it on display in a glass case! I humbly suggest Star Light and I look forward to the next one you do. Absolutely amazing. Guard it with bullet-proof glass! 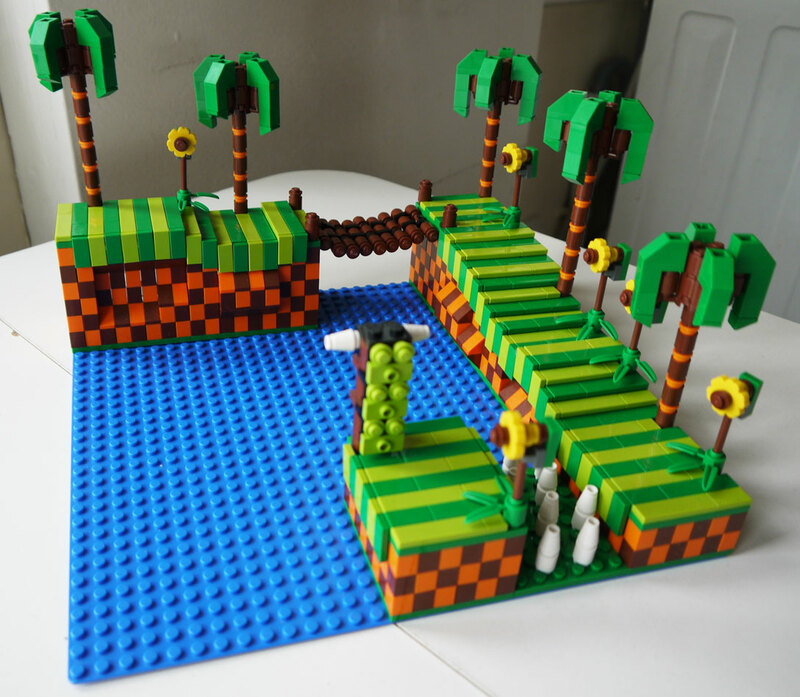 I suggest Marble Zone & have an idea: it would be really cool to see the real zone from the game next to your Lego version. Keep building! Well, you know there's a big new Sonic game announced when LiQuidShade finally returns from hibernation for the Winter. Yes, Zone: 0 may have officially closed its doors to new content a little while ago but I did want to keep the blog open for any passing Sonic thoughts. But aside from a couple of apps that were great, but don't quite fill the hole, there hasn't been a whole lot else worth thinking about in Sonic's world lately. In fact we've gone a solid year without any firm promise of a proper new platformer, which is why I'm pleased to finally see that Sonic Lost World has joined us, and it's quite nice to see that it's had relatively little in the way of leaks going before it too. In the unlikely event that I am, for some reason, your first port of call on all things new Sonic games (and I really shouldn't be), Lost World is heading to Wii U and 3DS in November (I'd imagine) and features Sonic on one of his more colourful and abstract adventures in which he battles six crazy looking characters known as the Deadly Six on the world of "Lost Hex". The trailer actually has quite a lot to say for itself, particularly about the kind of levels and designs we can expect this time around, at least if the one stage shown is anything to go by. Rather than basing it on firm ground as most levels have been in recent years, Lost World flings particularly cylindrical chunks of this level, simplistically titled Wind Hill, high into the air, more reminiscent of some Sonic Heroes levels. As lone playable character Sonic (SEGA seem pretty damn set on that these days don't they?) runs and hops across them, the gravity adjusts with him, allowing him to follow curved paths and twists in the roads without falling off. Exactly, it would seem, like Mario Galaxy and everyone's favourite canned Sonic game from the nineties, Sonic X-treme. The latter is possibly a coincidental similarity, but I'd find it hard to believe the former was anything other than a big inspiration. Nothing necessarily wrong with that, Mario Galaxy 1 and 2 are superb games, probably my favourites in the series, and if you're going to be inspired by anything, it's at least a good choice. I can see it working well with Sonic's speed, and we've seen plenty of hints of it before too, such as in gravity-flipping levels and the aforementioned cancelled Saturn game. I would say however that the visual design of Wind Hill and, one would naturally assume, probably the other levels as well, does not do much to mask the source of inspiration. In fact, it's almost as if Mario Galaxy had a Green Hill themed level in which Mario looked exactly like Sonic and could run much faster. It's this aspect that kind of makes me not quite as excited as I feel I should be or would like to be. It is a very interesting looking game, but my love of Sonic level design intricacies raises one or more of my eyebrows when looking at the trailer and screenshots. I love Mario games, but I use them here as an illustration of what I love most about Sonic levels in general, and what I slightly worry about with this game. They have always, for me, felt much, much more personalised. Mario games often number, not name their levels, "World 1-4" for example, and they are more regularly restricted by fairly generic level tropes - grassy level, castle level, mountain level, desert level, etc. That's fine, because that series has always favoured emphasising the difficulty curve of its extremely clever use of obstacles, and to some extent the level locations do not matter as much. Sonic has a slightly different approach though, and it's one that I adore. Each and every level is memorable in some way, easily separated from its neighbours. They have their own names for starters, but whether it's the purple dungeon bricks and scary spiked guillotines of Marble Zone, the long bouncy floor in Wacky Workbench or the mix of alien nature with construction machinery in Planet Wisp, every level leaves an impression you don't quickly forget. Common themes frequently recur of course, as in any long running series, but it's the way in which they're constantly being tweaked, reinterpreted and combined with others that gets me excited. I can't help but feel lately though that this philosophy is somewhat under threat, perhaps as a by-product of Sonic Team wanting to make it very clear that, after years of more serious games in real world settings, complex plots and diverse gameplay modes, they have not forgotten Sonic's roots and still know how to do things the old fashioned, "classic" way. 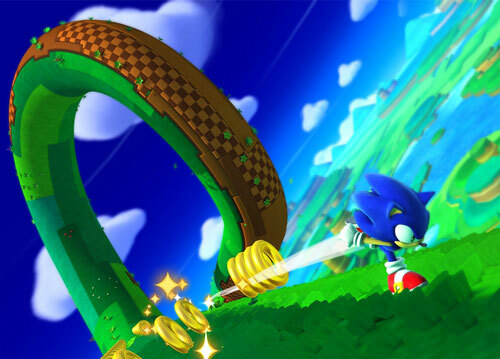 While this, most would agree, is very welcome, it means that we've seen an abundance of Green Hill Zone and other level clones, and other classic references like reintroduced badniks, as opposed to new designs that encompass the sprit of them without just being copies. It's something I keep banging on about I know, but after only about a quarter of Sonic 4 had that kind of originality, seeing that orange and brown checkered pattern for the umpteenth time on the walls of the new Wind Hill level does little to comfort me, unfortunately! In fairness, Lost World's level appears to have less in common with Green Hill than it may seem at first - it may not technically even be within the same trope, as this level takes place above fields, lakes and valleys rather than rocky seaside mountains, and the trees are more woodland than tropical. 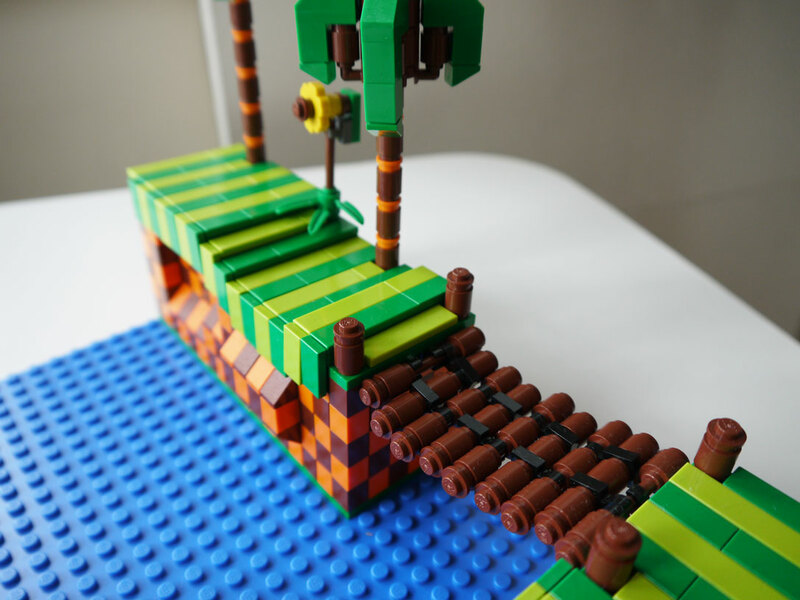 Although overly familiar elements like totem poles and log bridges are wheeled out once again, they are also joined, if you look closely at the screen shots, by some more interesting and unusual patterns, such as blocky grass and patchwork effects that do look quite nice. For all its differences though, its similarities overpower it, and it's a shame that just a change of pattern, colour or preferably both on some of those walls would have done wonders for this level's own individuality. For example, Mushroom Hill's patterns resemble Green Hill's general approach, but manage to look entirely different. Why can't we do something like that? It's not just the same old checkers and Motobugs that I'm finding slightly unsettling though, it's back to the parallels with Mario Galaxy that I'm having a little trouble with. It doesn't just apply to the general structural ideas of the game, it's the look too, it really does carry the same sort of colourful, simplistic, abstract style - almost as if Nintendo themselves have had a go at making a Sonic game. Even the clouds and trees look more whimsical and cartoony than normal. I suppose this concern is more of a subjective thing, but personally I'm not crazy about a style that runs too close to Mario's. There is a bit more to it than just cutesy child-like clouds and mountains with smiley faces on them of course - the abstract, geometric style of the blocky grass and walls in particular harks back to fairly traditional Sonic aesthetics, best seen in Sonic 1, Knuckles Chaotix and even a bit in Sonic Advance 2. Although that kind of stuff clearly suits and even defines Sonic, it's not actually my personal preference. I kind of like realistic aesthetics, but at the same time, exaggerating the location, making it bold and fantastical, as seen more in games like Sonic Colours or Heroes. Also, there's just something about seeing a whole chunk of Sonic level curved into a cylinder stretching out ahead that seems just a bit.. weird, and wrong. Hopefully it's not necessarily common throughout the game and other levels have different sorts of structures, using the gravity mechanic in different ways. And of course, all we really have to go on is one level, but we do have clues as to some of the others. 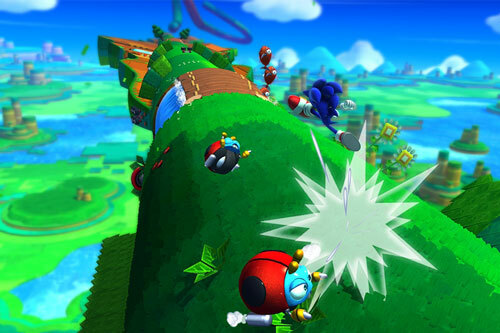 The initially released image of Sonic and Tails flying to the half-built world in the sky also suggests the themes of the other levels too, and although there's only so much you can tell, there's no denying that they suggest some pretty basic, again, almost Mario-like level ideas. From ice level to desert to fire, it doesn't get much more textbook platformer. That's not to say they won't have some unique elements to call their own, and in any case it's far too soon to judge just yet. However, I just can't shake the concern that in seeking to replicate Mario's success, they may be trading, completely unnecessarily, some of the things that make Sonic so great. Thank God the level even has a name (albeit a very boring one) and isn't simply just called "Zone 1". Perhaps I'm being rather harsh. It is a little unfair, after all, to judge a game just on one of its levels, but alas that's all we can do at the moment. My confidence that the game will still be fun remains resilient and sometimes you just have to ride out design decisions that aren't your cup of tea. Despite everything I've said, what I'm seeing does look gorgeous. I'm also intrigued by what IGN describes of the game's "parkour" system, essentially allowing you to run only when a trigger button is held, otherwise Sonic will simply just walk. I'd imagine this will simply set Sonic running in whichever direction you had him in when you pressed it, and then perhaps the thumbstick is used to quick dash or something, rather than change direction entirely. In skilled hands I can see this potentially making for a more controlled and satisfying experience, although that, coupled with all the new moves does make me wonder how easy it will be to pick up for new or less able players. It doesn't sound particularly simple to me. But it does sound like the most radical control change we've had in a long time now, so I'm very interesting in seeing some extended gameplay footage to find out how it works. Then there's the quick matter of the 3DS version. It's nice that it's being treated as a full 3D game rather than a strictly 2D one, but I always find these "lesser" alternatives to Sonic games just end up getting ignored. Sonic Generations on 3DS, Sonic Colours on DS, even Sonic Unleashed on Wii; I have them all, but I've clocked up much, much less time on them than their home console, or graphically superior counterparts, and I've no doubt it'll be the same this time around too. I always wonder, if they have to make entirely new levels for it anyway, how much more effort would it take to just make it an entirely new game, in its own right? Add a cheap, cheerful story and some simple, but well thought out level concepts and you're laughing. I suspect there's a clever marketing strategy behind releasing lesser versions, but I find them kind of annoying. For years Sonic games, in the eyes of fans, have been shooting for both quality and experiences reminiscent of the early days. Sonic 4 gave us the latter, Sonic Colours, the former, and Sonic Generations, both. Now, after finally having achieved these long sought goals and with two decades fully celebrated, where next? It's tough to know where to take the series and still keep it refreshing and interesting, especially following successful games, where there is so much more at stake if it flops. But I do applaud the fact that some whole new angles are being explored in the name of making things exciting, and I am hopeful for the game. But I just worry that it'll always be considered as a bit of a Sonic rip-off of Mario Galaxy. Sonic's Jump and Dash on mobile are brilliant but they too have extremely obvious sources of inspiration, and I just wonder lately if SEGA are at all capable of coming up with an interesting and truly unique angle to a Sonic game in the same way that Galaxy was to the Mario series. Too many more of these and Sonic will develop a reputation as being a bit of trend follower, rather than a trend setter, as he was when he first hit the scene. Nice read! I share the exact same views as you do, great to see that there's somebody out there that's as passionate to Sonic's past outings as I am! It looks like a great game, and seems as though Sega are pulling away from some of the awful 3D games that Sonic has been forced to run through - voice and rock music in-tow. Generations was really fun, but for me they changed the levels a bit too much, I was so excited to blaze through Chemical Plant again, but quite disappointed... it didn't feel like Chemical Plant. Colours was even better in my opinion, which is a surprise to myself because I feel most new Sonic games with new concepts put me off completely. There was just something that made me like it, I can't put my finger on it but it helped me regain faith for Sonic, and that he may be coming back full-blast. With the newest addition it looks like that comeback is still going in the right direction, I just hope we'll see some new footage soon. There's a thought that I've had for some years now that I just can't shake and I can't help but mention every time I go into a blue-hog themed rant. I still can't help but feel that Sega just need to make another 16-bit Sonic game, at least one more for old times sake. The creation would consume a fraction of the time, people and money it takes to create a 'current-gen' Sonic, but I'm about 100,000,000% sure it would result in massive profit. I'd gladly pay upwards of £20 for a new 16-bit Sonic, as I'm sure most of us fans would. Also current hardware limitations/space would be nothing to a 16-bit game, think of how many levels there could be! It does look fun, I admit, but it sure doesn't look like Sonic. And that's what worries me. Wow! To be honest, I thought you were never coming back LiQuidShade! It is nice to hear from you again! If you ask me, I simply don't think this game was the most healthy step for Sonic to take after Sonic Generations. I guess we'll just have to wait and see! It's a shame that Sonic Lost World isn't going to be available on the consoles (Xbox360, Xbox One, Playstation 3, Playstation 4). I love Sonic as much as anyone else does, but I personally want more sonic games to be on consoles a lot. My 250GB PS3 is a perfect example. The art style also isn't as appealing to me as that of Colours or Generations. I guess I was just really hoping for a game that was basically "Generations but new levels". On PC. Because a laptop and a Wii is all I really have and want to have. Speaking of which, @BradyMeyers I'm pretty sure the Wii U is a console. Just saying. That too, but really, Sony & Microsoft must have a stronger partnership with SEGA if we respective owners want to play Sonic games on those respective consoles (PS3, PS4, Xbox 360, Xbox One). That said, I'm holding my breath for another Sonic game to be released for both Microsoft's & Sony's gaming consoles, sometime soon.